This is an interesting application that can create mosaic art work from digital photographs. The main interface of AndreaMosaic is rather easy-to-use thanks to its intuitive layout. 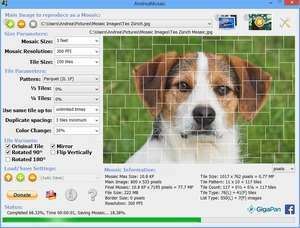 With AndreaMosaic, you can choose several options for creating a beautiful mosaic including the size, resolution and tile size. You can customize the pattern while also selecting how many times the same tile may be used. Version 3.38.0 is a freeware program which does not have restrictions and it's free so it doesn't cost anything. For security reasons, you should also check out the AndreaMosaic download at LO4D.com which includes virus and malware tests. Additional screenshots of this application download may be available, too.